Japanese myths, as generally recognized in the mainstream today, are based what the Kojiki, the Nihon Shoki, and some complementary books. The Kojiki, or "Record of Ancient Matters", is the oldest surviving account of Japan's myths, legends and history. The Shintōshū describes the origins of Japanese deities from a Buddhist perspective, while the Hotsuma Tsutae records a substantially different version of the mythology. The gods who were born from Izanagi and Izanami are symbolic aspects of nature and culture. 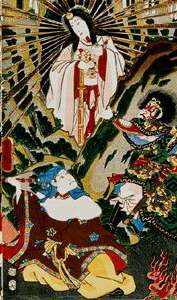 Susanoo, exiled from heaven, comes to Izumo Province (now part of Shimane Prefecture). It is not long before he meets an old man and an old woman sobbing beside their daughter. The old couple explain that they originally had eight daughters who were devoured, one after the other, by the dragon, Yamata no Orochi ("eight-forked serpent", who is said to originate from Kosi—now Hokuriku region). The terrible dragon had eight heads and eight tails, stretched over eight hills, and is said to have eyes as red as good wine. Kushinada-hime ("rice paddy princess") was the last of the eight daughters. Ōkuninushi (at the time he was just Ōnamuji without the august nickname) and his brothers, eighty gods altogether were rival suitors courting Princess Yakami/Yagami (八上比売) of Inaba to become his wife. They started out of their homeland of Izumo headed for the neighboring province, when the group encountered a rabbit who has been flayed (by crocodile-fish, usually interpreted as sharks) and lying in agony upon a sea shore. In a wicked-hearted gesture, they advise the rabbit to bathe in the briny sea and blow himself dry in the wind. The rabbit finds himself in worse agony. Ōnamuji, who came lagging behind, takes pity on the creature and tells it to wash himself in fresh water, then roll in the scattered fleece of the cattail plants. The cured rabbit makes a divined prediction that Ōnamuji will be the one to win Princess Yakami, "though thou bearest the bag," (Evidently his brother was treating him as a luggage carrier). Some of the gods first appointed to quell the middle world were derelict in their mission, or joined leagues with the terrestrial gods. After several false starts, two gods were finally successful. 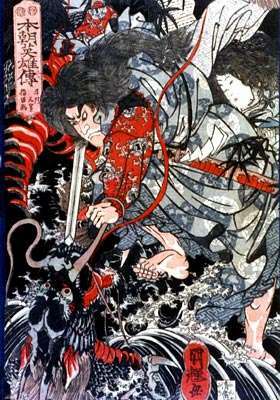 They were Ame-no-ohabari (aka Itsu-no-ohabari; elsewhere this kami is said to be a sword) and Takemikazuchi. 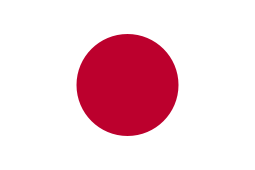 They embarked aboard the Ame-no-torifune or "Deity Heavenly-Bird-Boat" to their military campaign. These two sabre-rattling deities were able to frighten Ōkuninushi's two sons into flight, causing Ōkuninushi to abdicate and relinquish the territories to the Heavenly Grandson. Ninigi's elder son Hoderi or "Fire-Shine" had the gift of the bounty of the sea, and gained his livelihood by fishing (and bore the nickname Umisachihiko or "Luck of the Sea"). The younger son Howori or "Fire-Fade" had the gift of the bounty of the mountains, and was a hunter (and nicknamed Yamasachihiko or "Luck of the Mountains"). Luck of the Mountains was sitting on a beach balefully weeping, there came to his aid Shiotsuchi-no-oji (one of the deities now enshrined at Shiogama Jinja). The tide god built him a small ship described as being manashikatsuma (无間勝間, 間なし勝間, "basket without interstices"), and sent him on a journey to the fish-scaled palace of the Watatsumi (Sea God, often conceived of as a dragon-god). There he had a fateful meeting with the Sea God's daughter Princess Toyotama, and married her. After three years, he remembered his brother and his fishhook, and was longing to return home. 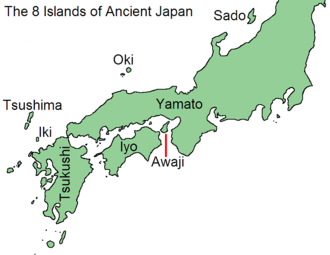 Ugaya married his aunt, the sea princess Tamayori and had five children, including Yamatobiko, who was later to become Emperor Jimmu. In the Nihongi, the "Age of the Gods" (kamiyo (神代)) section ends here, and is followed by sections under the titles of the reigns of each Emperor. The first legendary Emperor of Japan, best known by his posthumous name of Emperor Jimmu(Transition from Age of the Gods to Human Age), was referred to in the records by the title of Iwarebiko (神倭伊波礼琵古命/神日本磐余彦尊, Kamu-yamato Iware-biko no-mikoto). He is the son of Ugaya, descendent of Ninigi, and the sea princess Tamayori. His given name was Hiko-hohodemi. With claimed descendent from sun-goddess Amaterasu through Ninigi, Emperor Jimmu launched an expedition to capture Yamato. 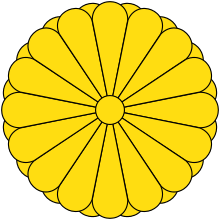 After Jimmu's death, an elder prince named Tagishishimi (who was not first in line as successor) moved to consolidate power under him while everyone else was in mourning, and plotted to slay his two younger half-brothers. The plot was suppressed, and the younger prince who had the courage to pluck the bow and shoot Tagishishimi fatally was cede the crown to become the next emperor, Suizei. The 10th, Sujin and 11th emperor Suinin are discussed under their own books of Nihon Shoki. Tajimamori has later been hailed as the Kami of wagashi (Japanese confection and sweets), revered at Nakashima Shrine in Toyooka, Hyōgo, though this is little known trivia to the average Japanese. Kinshi, blindingly bright golden kite that aided Jimmu; it may be a double of the crow. ↑ A Brief History Of The Immortals Of Non-Hindu Civilizations. Aryavart Sanatan Vahini 'Dharmraj'. p. 21. ISBN 9781329586079. ↑ Yang, Jeff, Dina Gan and Terry Hong. Eastern Standard Time. p. 222. Metro East Publications, 1997. ↑ "Japanese creation myth". Public wsu. Retrieved 20 January 2016. ↑ Kelsey, W. Michael (1983). "Untitled", Asian Folklore Studies Vol 42, No 1, p. 142–3. ↑ Littleton, C. Scott, (May 1983). "Some Possible Arthurian Themes in Japanese Mythology and Folklore", Journal of Folklore Research. Vol 20, No 1, p.67–81. ↑ Fairchild, William (1965). "Mika: Jar Deities in Japanese Mythology", Asian Folklore Studies. Vol. 24, No 1, p. 81–101. ↑ Littleton, 1983, p. 72. ↑ Chamberlain 1919, p.120, " Herb-Quelling-Great-Sword", etc. ↑ Keene, Donald (1955). Anthology of Japanese Literature. Grove Press. ISBN 4-06-158833-8. , p.54, citing Kojiki XXXIX-XLII. ↑ Takeda 1977, Kojiki, p.71,255; Nihongi (Ujiya 1988) does not mention the animal as sending him back, but involves the 1-hiro croc and 8-hiro croc-fish when he initially reached the Sea God's realm. Aston 1896's Englished Nihongi either emended the passage to conform with Kojiki or followed a different manuscript. ↑ Fairchild, 1965, p. 94. ↑ Metevelis, Peter (1983). "A Reference Guide to the Nihonshoki Myths", Asian Folklore Studies. Vol 52, No 2, p. 383–8. ↑ Chamberlain 1919, Sect. LXXIV, p.245- ""